Our Fertility Support Pack was created to support the many women and men desiring support for a healthy conception that founder and Nutritional Therapist Henrietta Norton works with in her clinic. Whether to address hormonal imbalances, sperm count or simply to optimise your nutrition, research has shown that improving your nutritional store in the 3-6 months prior to conception can support both preconception and the mother and baby’s health throughout the pregnancy and post-birth. Our Fertility Support Pack was created to support the many women and men desiring support for a healthy conception that founder and Nutritional Therapist Henrietta Norton works with in her clinic. Whether to address hormonal imbalances, sperm count or simply to optimise yournutrition, research has shown that improving your nutritional store in the 3-6 months prior to conception can support both preconception and the mother and baby’s health throughout the pregnancy and post-birth. Vitamin C incorporated in citrus pulp; Mineral enhanced Yeast providing Thiamin, Riboflavin, Vitamin B6, Vitamin B12, Vitamin D3, GTF Chromium, Calcium, Magnesium, Copper, Selenium, Vitamin E, Biotin, Choline, Inositol, Zinc, Niacin, Molybdenum, Iodine, Boron, Iron, Manganese, Pantothenic Acid and L-Methionine; Folic Acid (as naturally occuring Folate) and Vitamin K incorporated in Alfalfa concentrate; Beta-Carotene incorporated in Carrot concentrate; N-Acetyl Cysteine, Organic Beetroot powder and Cordyceps Sinensis powder. Vegetable Cellulose (capsule shell). Excipients, wheat, soya, gluten-containing ingredients, artificial colours, added sugars, flavourings & preservatives. Contains no live yeast at time of manufacture. If you are pregnant, breastfeeding, taking medication or under medical supervision, please consult your healthcare practitioner before taking any food supplement. We advise taking your supplements a minimum of 2 hours from the time of taking any medication. Store in a cool, dry place away from direct sunlight. Keep out of reach of children. Food supplements are not to be used as a substitute for a varied, balanced diet and healthy lifestyle. Men's Food-Grown® Fertility: 2 capsules per day with or without food. Women's Food-Grown® Fertility: 2 capsules per day. Can be increased to 4 per day if required. 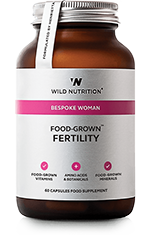 Our Fertility Support Pack was created to support the many women and men desiring support for a healthy conception that founder and Nutritional Therapist Henrietta Norton works with in her clinic. Whether to address hormonal imbalances, sperm count or simply to optimise your nutrition, research has shown that improving your nutritional store in the 3-6 months prior to conception can support both preconception and the mother and baby’s health throughout the pregnancy and post-birth.